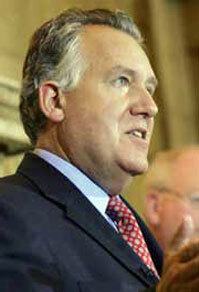 AN appeal by the former British Secretary of State in the North Peter Hain MP to overturn a High Court ruling that the appointment of Bertha McDougall as an ‘Interim’ Victims Commissioner, that he made during his time as Secretary of State, was unlawful failed in Belfast’s Court of Appeal on Tuesday. In 2006 the British Attorney General announced an investigation to find out if Hain or his NIO officials misled the Belfast High Court. The case was referred to the Attorney General by presiding High Court Judge Girvan who accused Hain and top NIO officials of attempting to pervert the course of justice. The case emerged during a judicial review taken by Brenda Downes, the widow of plastic bullet victim Sean Downes, challenging the British Secretary of State’s appointment of RUC widow Bertha McDougal as interim Victims’ Commissioner. Brenda Downes attended Tuesday’s hearing. Brenda Downes attended Tuesday’s hearing and afterwards in a statement issued through Relatives for Justice said she was, satisfied the court had upheld the original ruling that the appointment was unlawful. Downes said that her motivation in initially challenging the appointment was about ensuring equality, rights and fair play for all victims and survivors of the conflict and ending “decades of the practice of exclusion and discrimination at the highest levels for political motives”. She also added that, “The case had also set legal precedents regarding discovery and disclosure of information concerning judicial review. Consequently the process overall that I initiated has had a direct, positive and beneficial knock-on effect in terms of ordinary citizens ensuring that a rights based culture is brought about and achieved.